Every Christmas my Mom and I exchange calendars. She receives a DB calendar and I receive the new Sierra Club offering, which hangs in our kitchen throughout the year. I am often inspired by the beautiful nature images and every once in a while I try to recreate something from the calendar. 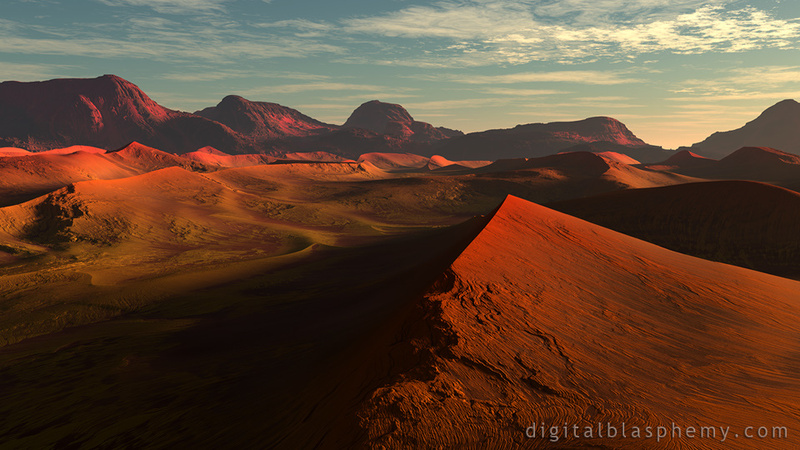 I created this scene as an exercise to learn how to better use World Machine and the Geoglyph plugin. I hope you enjoy the results! Just found this picture. Its amazing. Have set it as my background! WOWEE this is beautiful! Some of your scenes can be very realistic-looking, but more beautiful than can usually be captured with a camera. I frequently have to explain to people that your images are digital renders. Very cool! 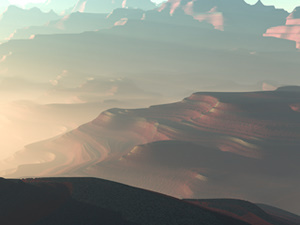 "Makes me miss the desert"
I spent a lot of time in the Mojave and south-east Asia, and love this render! "Maybe best desert themed wallpaper yet"
I missed this one somehow when it came out. Definitely a refreshing variation on desert/sand theme wallpaper, which are usually too bright for my preference. That is not an issue here, where the dunes are rich in color and texture. The second I looked at this rendering, I actually gasped, it's that beautiful...to me. I've yet to travel to Utah, or Death Valley, or any other arid location on our planet, but this is a resplendent example of one, and again sir, your amazing talent. Live long, and Prosper. I'll help some with the prospering part. You're the best! Reminds me of a sand dune made of Navajo Sandstone in Southern Utah(up by Zion) -- this one is my all time favorite! Beautiful. I love your "places" artwork - I always want to go. i tried making a digital painting of a canyon scape, and the amount of work i put in was insane. when i look at this, i'm awed by the level of detail and stark beauty, that awe made all the more powerful for having some first hand experience with the difficulty of doing justice to this type of landscape. truly amazing! Not the kind of place that would be easy to cross in the heat of the day. These sands are active! Those darn tally manipulators! Perhaps they are "Highland Spring" fans, determined to see it stay at #1 forever. Seriously, I understand the problem, Ryan, but my only issue with setting the requirement so high is that some highly rated renders will never get to 250 votes. For example, your terrific Christmas render "Sleepwalker Woods" (Winter/Night) scored a 9.11 rating, but only has 220 votes. Since it's from 2015, it's not likely to get many more. "I've increased the required votes to 200 in order to be listed on the 'all-time' pages." ... except that the text at the bottom of the Top Rated page reads "... 250 votes minimum for inclusion"
I've increased the required votes to 200 in order to be listed on the "all-time" pages. When the appear high up on the list with too few votes people tend to drop 1's on them to lower the ratings. Why I do not know but with at least 200 ratings it will be harder to manipulate the tally. This terrific render should have surpassed "Highland Spring" for the highest rated render of all time, but for some reason none of the recent works show up on the list. Enough members have voted, unless the parameters have changed. A glitch in the software perhaps? You knocked this one outta the park, I'd call it a grand slam if it had slightly more dramatic geologic features but that's not a criticism, as I can't find anything wrong at all in your rendering. What a great creation Ryan! Wow this is a lovely picture. love the detail in the textures. Could be another planet at sunset... could be the future.. or the past. Shifting Sands is open to vast interpretation by the viewer. It's the appeal of art vs technical achievement. Bravo! I would like to see more of these. I calm nice picture with not so much "things" on it. However much detail! Great as wallpaper. Beautiful picture! Ryan, as a writer, I've always appreciated your pieces like this. It's atmospheric, it invites questions to be filled by the viewers imagination. Too many of your recent works have focused on the technical challenge of creating the most complicated image. You comment frequently on how long it takes images to render. That complexity buries the charm and mystery of your early works. It's the reason I have not switched to a Lifetime Supporter. With Shifting Sands you manage to maintain both the complex detail of the image AND the sense of mystery and story telling. Bravo. More like this please! Just when I think you can't possibly exceed yourself, Ryan, you come up with...this. Incredible. But I have to disagree with those who want you to add various people and/or animals. It's perfect as is. The textures, colours and lighting come together to give a feeling of ancient, and maybe something that was once very different but that was a long long time ago. Anyway, I like it, a lot. Love this desert landscape the colours are so lively! I literally just shouted that out loud when I first saw that. That's absolutely amazing. 2. A Gunslinger to follow. Incredible! That's all that I need to say. Oh my gosh Ryan this is absolutely stunning!!! I seriously thought it was a picture from the calender your mom gave you. It looks so professional. Simply amazing. Even my husband was amazed. Just finished saving this to my "DB Favorites" folder, setting it as my desktop background, and giving it a 10. Shoot, if the scale went up to 15, I'd have given it that. Brilliant, as the other member said. I won't bother to conjure more mere words. Great mix of colours, depth and shade. Keep up the good work! "10" - I love the natural detail in this one! Is there any way to make this available in dual screen resolutions? Such a simple natural landscape yet there is so much detail and shading/shadowing; I love it! Another great piece! You never cease to out do yourself Ryan. Images like these are simply the reason I stick around and visit your page daily for updates. Exquisite. The colors playing across the image are amazing. Very nice work. It makes me think of the movie Dune. Love it! Wow, I don't give out a perfect 10 very often. I try to save that score for the pieces of yours that truly speak to me. This is absolutely stunning, and I can't wait to see the multis! Wow this one is really cool! With a red sky it could also me Mars. This is great! Would love to see more 'real world' scenes like this and more planetscapes too. Day night versions always welcome. Good to see you doing images like this again, haven't been the biggest fan of the plant factory stuff tbh. Ryan, I normally prefer night time or dark renders but this turned out beautiful! I'd still like to see a night sky with the sand lit by a full moon but I truly love this version. The detail in some of these, you could be cheating and it's really a photo... amazing Mr Bliss. This is just gorgeous! I love the peaceful feeling it engenders. You've outdone yourself, Ryan... certainly passes the Graphics Turing Test for me; congrats on an exceptional piece! Just kidding about the sandworms. However, it does make me think of Arrakis. This is one of my favorites so far. I love the array of different colors and hues and the brightness is not overpowering, It's just dark enough to allow the icons on my desk top to pop out well enough to see them. Awesome picture - is there a multi-screen in the works? Only one thing missing: some kind of animal walking in the shadowy areas of this scene. I like this one. 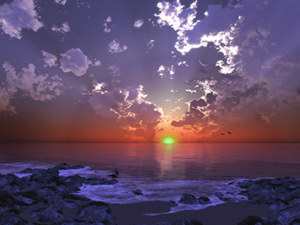 The sky looks pleasant and peaceful yet the sands look dry, desolate & barren. It's like sweet and sour sauce. I was blown away by the realism of this one. Even on your most beautiful works, I can often tell it's CG, but this one could have fooled me.